HOONS beware: police are about to launch a crackdown on one of the Sunshine Coast's hot spots for lawbreaking revheads. Officers from the Mooloolaba Police Beat and Maroochydore Police Station will turn their attention to hooning activity in the Mooloolaba area in the coming weeks. Mooloolaba Police Beat officer in charge Sergeant Steve McDonald said the popular tourist spot has also unfortunately become popular with hoons, especially during the nights from Thursday through to Sunday. "There will be an increased police presence in the area at certain times in coming weeks to combat this problem," Sgt McDonald said. 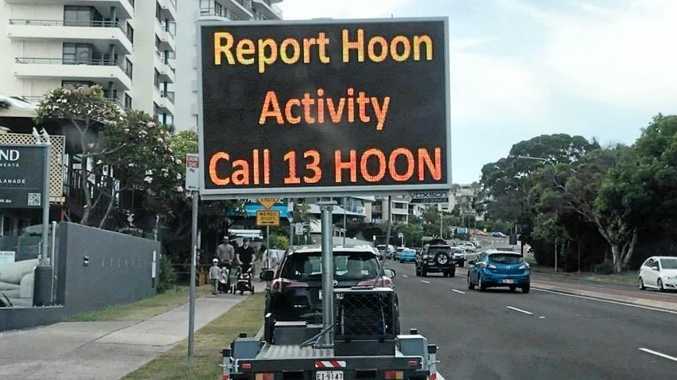 "We are also asking members of the public to report any hooning activity by calling 13HOON (134 666). "Any incidents reported will be investigated and action taken." A large mobile LED sign has been deployed as part of the operation, encouraging witnesses to report hooning.